What four small pieces of rock can teach us about the history of the solar system. Imagine a traveler from outer space, hurtling through the atmosphere of a bright, blue planet to land upon a world populated by strange, multi-tentacled creatures. It sounds like something from the pages of a science fiction novel, but it’s a true story and it’s written in stone. 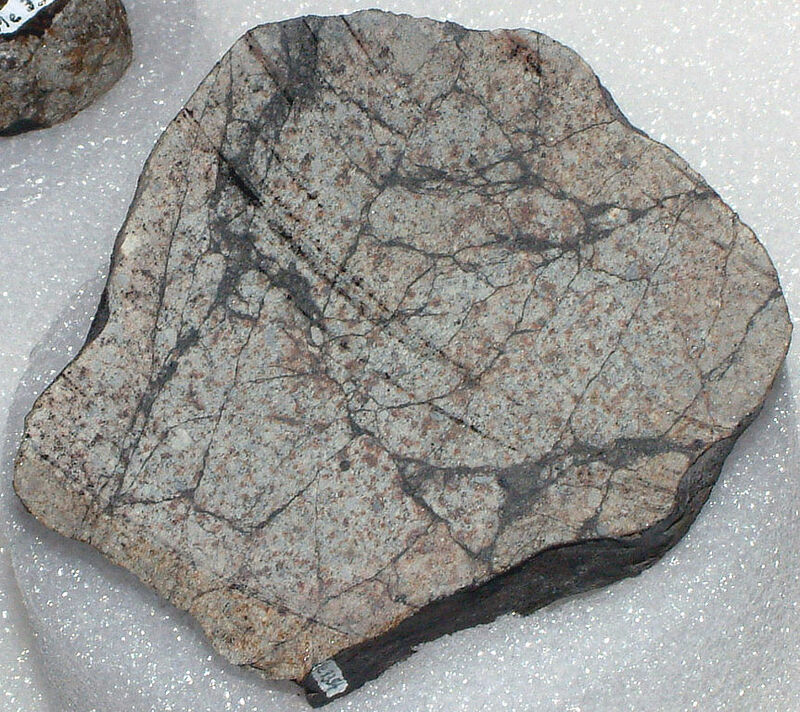 The stone is at Chicago’s Field Museum of Natural History, one of four unusual slabs in a recently opened display of meteorites. The museum has pieces of many famous meteorites.There’s a thousand-pound remnant of the Canyon Diablo meteorite that gouged the great meteor crater in the Arizona desert. Canyon Diablo iron meteorite (IIIAB) 2,641 grams. Note colorful natural patina. Image is missing a needed scale. There are fragments of the Chelyabinsk meteor, which made a fiery descent over Russia in 2014. There is even a meteorite that fell on a garage in Illinois in 1938, displayed alongside the holed seat and dented muffler of the car it struck. In a photograph taken shortly after the fall, the vehicle’s owner looks rather dismayed. But possibly the most intriguing meteorites in the collection are four that are embedded in slabs of limestone. They are surrounded by a whitish discoloration of the rock, evidence of something leaching from them. These are fossil meteorites. One of them, our aforementioned celestial visitor, rests only inches away from the mineralized shell of a cephalopod, an extinct mollusk related to the modern nautilus. Fossils of prehistoric sea creatures are common in rocks dating from the Ordovician Period, which lasted from 500 to 435 million years ago. But fossil meteorites are rare. In fact, they were unknown until 1952, when the first find was made in Sweden. To date, only 115 have been found, almost all of them at a single quarry. Among the wooded hills along the southeast shore of Lake Vänern in southern Sweden, a line of rust-colored bluffs overlooks a smaller lake where limestone has been quarried for many years. This is the Thorsberg quarry, near the town of Kinnekulle. Striations in the stone there represent layers of sediment laid down over millions of years, when this place was at the bottom of an ancient sea. In that age there were no land animals or even true vertebrates; the first dinosaurs were still 230 million years in the future. Life was in the ocean, teeming with creatures now long gone. Trilobites scuttled along the sea floor and crinoids waved lazily with the movement of the water. Among them swam cephalopods of the genus Orthoceras, the apex predator, residing within a long, conical shell, tentacles groping for whatever luckless creature would become its next meal. This was the pattern of life in the Ordovician ocean; preserved by the long, slow process of fossilization to record a chapter in the history of life on Earth. But something extraordinary happened in the middle of the Ordovician Period. Meteorites began to fall among the future fossils, lots of them. As the meteorites settled into the sea floor, they were buried along with the remains of the sea creatures to become fossils themselves. And just as the fossilized animals tell a story about the history of life on Earth, the fossil meteorites relate a chapter in the history of the solar system. That story begins in the asteroid belt. The vast majority of meteorites that fall to Earth come from this ring of irregular, rocky bodies that never managed to form a planet. The asteroids occasionally jostle each other and when they do, the bits and pieces broken from them are sometimes sent Earthward. But 470 million years ago, there was a titanic collision among the asteroids. It shattered one of them completely in the biggest breakup the solar system has seen in the last 3 billion years. Immense amounts of debris from this collision were flung toward the inner solar system, where it quickly subjected Planet Earth to an intense bombardment. On a cosmic time scale, the number of meteorites falling to Earth jumped overnight. Scientists now refer to this doomed asteroid as the L Chondrite Parent Body (LCPB). That’s quite a story, but how can we know it’s true? After all, the trilobites didn’t leave us any observation logbooks. Nature, however, has left us a number of clues in the limestone beds of the Thorsberg quarry and in the meteorites themselves. Cosmochemistry is the study of the composition of materials in the universe and the processes that produced them. Like detectives tracking down a mystery, Heck and his colleagues have been using a combination of geology and cosmochemistry to piece together the story of the LCPB. The first step in proving the story is to verify that the objects found in the Thorsberg quarry are meteorites. “It’s not easy to identify a meteorite by just looking at it,” says Steve Zitowsky, who works in the Field Museum’s Pritzker Center. “People send us lots of items that they’ve found, thinking they might be a meteorite. Usually they’re not.” Zitowsky keeps the museum’s meteorite database up to date, weighing, measuring and photographing each new specimen. “I also found the critters,” he says with evident satisfaction, on examining the slabs with the fossil meteorites. Identifying fossils as meteorites also poses a special challenge. They’ve been buried and embedded in stone for hundreds of millions of years. Just as the seashells underwent a mineralogical change, turning to stone over the eons, so did the meteorites. The meteorites, of course, were already stone, but they underwent a process called diagenesis, which changes their mineral content. That’s what caused the whitish discoloration in the stone surrounding them. Researchers have to study their microscopic structure, along with their chemical composition, to be sure of their identity. The presence of the mineral chromite (FeCr2O4) in the fossils was one thing that identified them as meteorites. “Chromite is very resistant to diagenesis,” says Heck. Another important giveaway is the presence of chondrules: small, round particles found embedded inside the meteorite. An ordinary chondrite meteorite displays the unique round “chondrules” that give this type of meteorite its name. James St. John. Although meteorites come in many varieties, there are three basic types: iron, stony iron, and stony. Stony meteorites are by far the most common, making up about 96 percent of those that fall to Earth. They are composed largely of silicate minerals, such as olivine and pyroxene. Iron meteorites, as the name suggests, are mostly iron, although they often contain other elements, such as nickel and cobalt. Stony irons, the most rare of the three types, combine the characteristics of the other two. The type of meteorite depends on where it came from in the parent body that broke apart to produce it. Some asteroids are differentiated — that is, they have an iron core surrounded by a rocky mantle and crust, just as Earth does. Differentiation occurs when a body is heated by collisions or radioactivity to the point where its materials can flow. The iron meteorites come from the core of such a body, stony irons from a narrow region between the core and mantle, and stony meteorites from the mantle and crust. 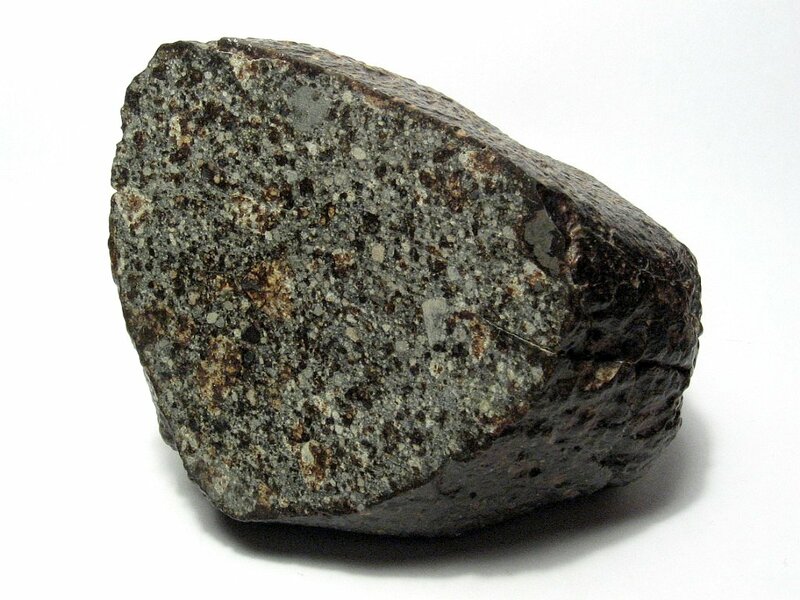 Stony meteorites also come from asteroids that are not differentiated. Some asteroids were never hot enough to form an iron core, but did generate enough heat to melt bits of material embedded in them. These melted mineral grains are called chondrules and meteorites that contain them are called chondrites. Microscopic examination of the fossil meteorites shows that they are all chondrites. Having established that the embedded stones in the quarry are meteorites, and specifically that they are chondrites, can scientists go a step further in demonstrating that they all came from the same parent body? As a matter of fact, they can, because chondrites come in several varieties. The family of ordinary chondrites (there are also some not-so-ordinary ones that won’t be discussed here) includes three basic types: These are the H, L and LL chondrites. The H chondrites have a relatively high metal content; the L chondrites have a low metal content; and the LL chondrites have both a low metal content overall and a low iron content relative to other stony meteorites. Of the meteorites that fall to Earth today, 38 percent are L chondrites. In contrast, all of the fossil meteorites found to date are all L chondrites. They were the predominant type of meteorite in the Ordovician and moreover, they all came from the same asteroid, the L Chondrite Parent Body. What happened after the LCPB disintegrated? The distribution of the meteorites in the quarry provides a clue. The limestone in which they are embedded was laid down as layers sediment over millions of years. The bottom layers are the oldest and the upper layers are the youngest. Geologists determine the ages of the layers by several methods. By applying sedimentation rates measured in modern environments, they can estimate how long it took to build up a layer. Index fossils, which are fossils of species known to have lived at a particular point in time, can pinpoint the age of a specific layer. There were many species of the mollusk Orthoceras and they are so common at Kinnekulle that the limestone is called orthoceratite. Finally, the decay products from natural radioactivity can date the rocks. A combination of these methods shows that the L chondrites began to arrive here just under 470 million years ago. And when they arrived, they came en masse. Birger Schmitz of the University of Lund in Sweden has been searching the Thorsberg quarry for fossil meteorites since 1993. The search has covered all of the old sea floor that has been quarried since then. “There is a clear and confirmed two-orders-of-magnitude increase in the flux of small meteorites to Earth,” says Schmitz. “The abundance of meteorites on the mid-Ordovician sea floor is far too high to be explained by a meteorite flux similar to that of today.” When the debris of the LCPB breakup began to reach this planet, meteorites fell with a frequency 100 times the modern rate for a million years. Furthermore, data from preserved craters indicates an order-of-magnitude increase in the flux of small asteroids as well. There must have been some spectacular meteor showers, but unfortunately nobody was there to see them. Not only did the L chondrites bombard Earth in huge numbers, they did it very quickly. The typical travel time for a meteorite is millions to tens of millions of years. This is the time from when its parent body breaks apart to when a piece of it lands on Earth as a meteorite. The fossil meteorites, however, began to arrive mere tens of thousands of years after the breakup of the LCPB. “They came to us by express delivery,” says Heck. How is it possible to know how long a meteorite travelled through interplanetary space? There would have to be some kind of clock built into it. There is such a clock and the cosmochemists are able to read it by measuring the amount of certain rare isotopes of elements that are in the meteorite. The clock works like this: Every atom of every element has a mass number equal to the combined number of protons and neutrons in its nucleus. For example, helium with two protons and two neutrons has a mass number of 4 and is written as 4He. Likewise, an atom of neon normally has 10 protons and 10 neutrons and is denoted as 20Ne. In rare cases, a nuclear reaction can produce a nucleus with fewer or more neutrons than normal, resulting in isotopes like 3He (2 protons, 1 neutron) or 21Ne (10 protons, 11 neutrons). On Earth, naturally occurring neon has only about a quarter of a percent 21Ne; naturally occurring helium has a mere ten-thousandth of a percent 3He. These rare nuclei are produced by cosmic rays, the high-energy radiation that permeates outer space, and are called cosmogenic isotopes. While an asteroid is intact, the rock in its interior is shielded from the cosmic rays and cosmogenic isotopes are not produced. When the asteroid breaks apart, the fragments are exposed to cosmic rays and production of cosmogenic isotopes begins. When the fragment falls to Earth as a meteorite, it is shielded once again by Earth’s atmosphere and production of the cosmogenic isotopes stops. Thus, the quantity of cosmogenic isotopes in the meteorite provides a measure of how long it was travelling in space. 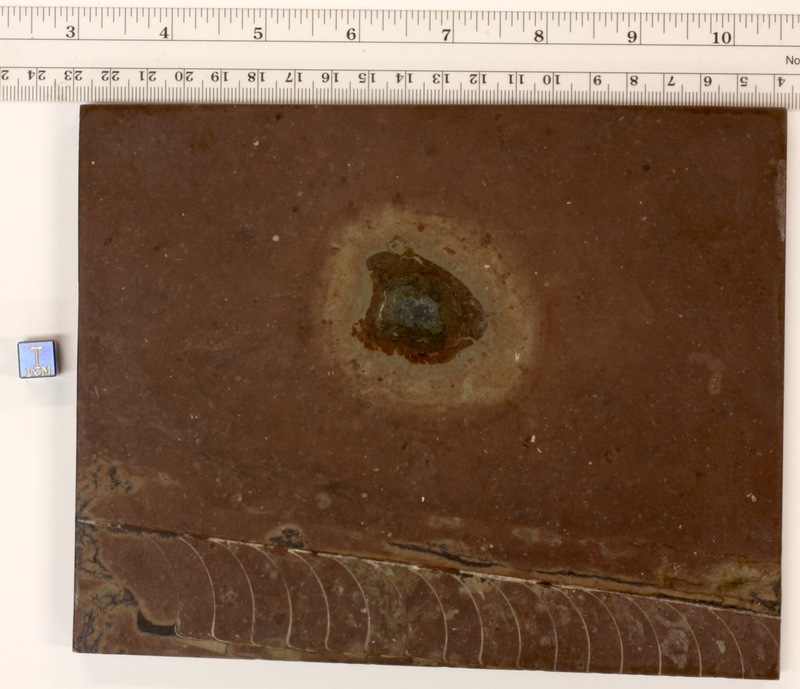 Heck and his colleagues studied the fossil meteorites for cosmogenic isotopes of 3He and 21Ne, cross-checking the results against the layers of rock where they were found. Their remarkable result was that the older the rock layer, the less time the meteorites in it had spent in transit. This is basically the result you’d expect if all of the meteorites came from a single parent body, with the ones making the shortest trip sitting here longest. What is surprising, though, is just how little time it took them to get here. That celestial traveler mentioned at the beginning of the article spent a mere 50,000 years on its journey here, only 1 percent of the travel time of a typical meteorite. As if being embedded next to a cephalopod didn’t make it rare enough. The probable explanation for this rapid transit, says Heck, is that the breakup occurred near an orbital resonance, a spot where the gravity of Jupiter pulled them out of the asteroid belt and onto an Earthbound expressway. That’s a good deal of evidence to support the story of a cataclysmic collision of asteroids followed by a rain of L chondrites on Earth, yet there is still another way to check it. What about L chondrites before the breakup of the LCPB? We know that L chondrites dominated the meteorite flux in the mid-Ordovician, but today, they’re just over a third of the meteorites landing here. So another way to verify the story of a big burst of meteorites from the LCPB is to look at how common or rare L chondrites were in the early Ordovician Period. The problem is how to check for L chondrites when there are so few meteorites to be found. The answer is micrometeorites. Meteoritic material is constantly falling to Earth. The planet typically gains about five tons per year from meteorites, much of it in the form of tiny grains or microscopic fragments coming off of larger bodies. With the proper chemical methods, these micrometeorites can be recovered from the limestone. In a recent international study, scientists recovered micrometeorites from a Russian quarry and studied their isotopes to determine their type. 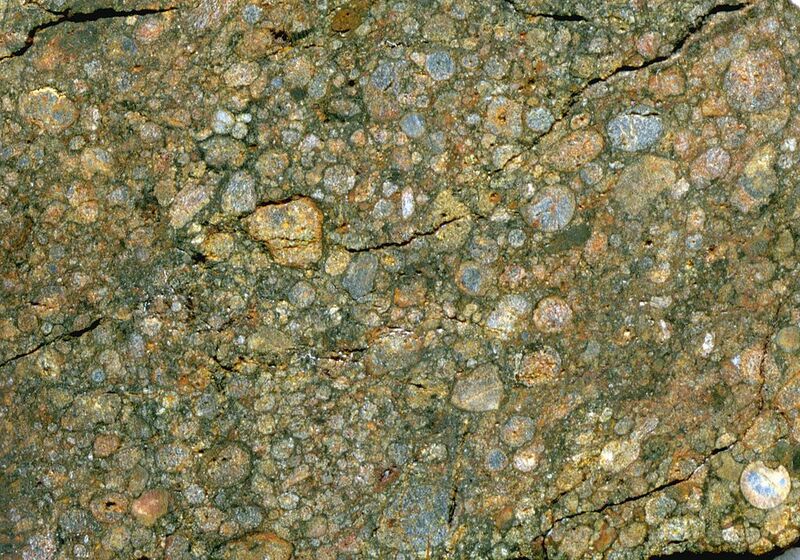 They found that prior to 470 million years ago, most of the meteorites falling to Earth were achondrites; that is, stony meteorites with no chondrules. L chondrites were very rare. Once again, the LCPB story is verified. This sort of cosmochemical research, however, might go well beyond verifying the hypothesis of a single asteroid breakup. Schmitz has suggested that, just as geologists use strata of rocks and biologists use strata of fossils to describe the progression of Earth’s history, so might astronomers use meteoritic material to develop an astrostratigraphy that could add to our understanding of this history. Over the years, some scientists have conjectured that meteorites have been at least partially responsible for mass extinctions and subsequent evolutionary events. 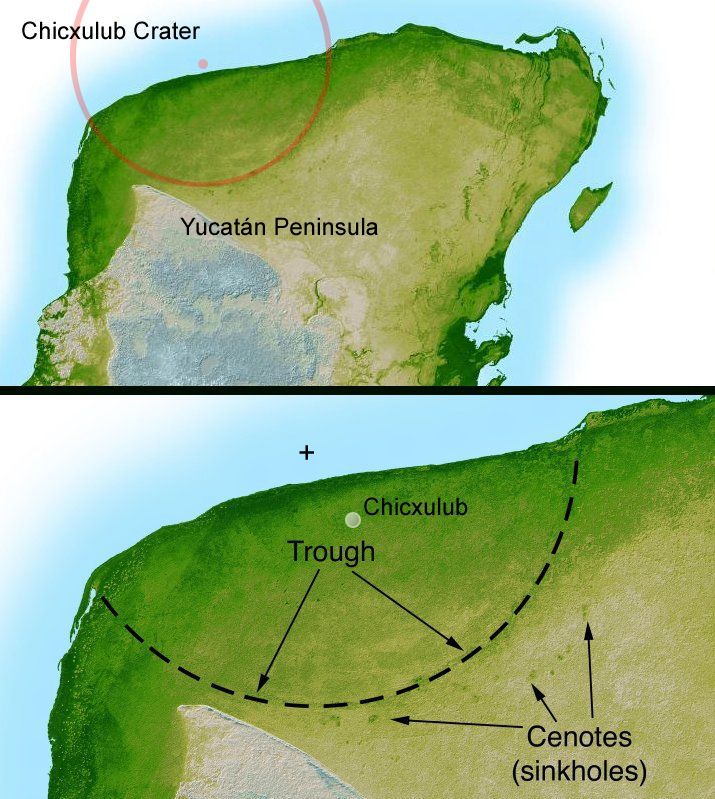 So far, only the Chicxulub Meteor, which struck at the end of the age of dinosaurs, is known to be associated with such an event. This shaded relief image of Mexico’s Yucatan Peninsula show a subtle, but unmistakable, indication of the Chicxulub impact crater. Most scientists now agree that this impact was the cause of the Cretatious-Tertiary Extinction, the event 65 million years ago that marked the sudden extinction of the dinosaurs as well as the majority of life then on Earth. A more thorough understanding of fossilized meteorites and micrometeorites could further test such hypotheses. The Field Museum has displayed its four fossil meteorites in a section that was added to the meteorite exhibit in early 2017. These are the only fossil meteorites in the western hemisphere, so they have a prominent place in the display. Even so, they’re not alone, because the LCPB isn’t quite finished with us yet. Just before midnight on March 26, 2003, residents of Park Forest, Illinois, were startled by what many thought was a bomb. Bright flashes in the sky, resounding booms and falling debris were reported throughout this Chicago suburb. It was, of course, a meteorite. Several homes were hit and one strike left the occupants looking up at a softball-sized hole in their ceiling. Fortunately, nobody was hurt. For the Chicago Center for Cosmochemistry at the nearby University of Chicago and for the Field Museum, the fall was a bonanza. When the fragments were collected and studied they were found to be L chondrites from the same source as the fossils in the Thorsberg quarry. Pieces of the Park Forest meteorite now reside in a display case alongside the fossil meteorites from Sweden. After 470 million years, they are reunited at last.